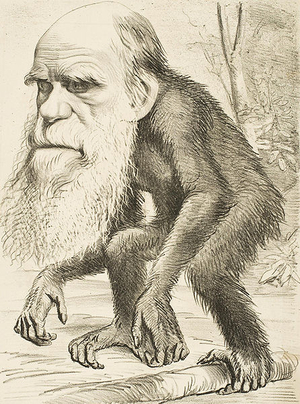 Caricature of Darwin fra the magazine "The Hornet". Darwin's theory was often referred to as "the ape-theory". From a scientific point of view, there is no doubt about the validity of the theory of evolution. It is being used in laboratories all around the world by thousands of scientists as the foundation of their work and continues to be a fruitful basis for gaining new knowledge about nature. Part of what characterizes scientific knowledge is that it continues to evolve. That goes for the evolutionary theory as well, although some of the most important basic principles where formulated by Darwin himself. Although the Darwinistic theory of evolution is deeply integrated in our scientific theories, work and everyday life, it also has a different life and agenda outside the research world. In the public debate, in popular culture and in all kinds of different non-academic contexts, we find a lot of conceptions, ideas and claims about Darwin and the evolutionary theory. In other words there are a great number of “Darwin-Myths” to be found in the public. Sometimes these “Darwin-Myths” are simply an expression of a superficial knowledge of what the evolutionary theory really is all about. In other cases, they are an expression of how Darwin and the evolutionary theory are used in very specific contexts in order to serve a certain purpose. This is for instance the case in American trials regarding “Scientific Creationism” and “Intelligent Design”. In the following, you can read about some of the most common "Darwin-Myths".